In honor of the New Year, we teamed up with our favorite productivity pals to offer you the best gift we can think of: awesome deals on amazing productivity tools. Whatever your pain point, this productivity bundle has something to alleviate it. These are products we love and use ourselves. To us, the hours and headaches saved are more than worth the full price. Happy New Year from all of us at SaneBox! A simple, beautiful password manager that keeps you safe online. Share 1Password with your whole family. Create your new 1Password Families account and get the first 6 months free. Get your point across with Droplr, a simple but powerful file sharing and screen capture tool. *Use code DroplrSaneBox2Months to redeem. Let Evercontact save you time, and possibly lost contacts, by turning your emails into an always complete and up-to-date address book! Automatically keep your individual or centralized contacts updated for Gmail, Google Apps, Outlook, Office 365, Salesforce, and more. *Sign up and redeem the promo code “SANEBOX-1701″ in the Account section. RescueTime helps you understand your time on your devices, focus on activities that really matter, and find a better balance in your digital life. You type too much. Gain hours back by never typing the same thing twice. TextExpander lets you instantly insert snippets of text from a repository of emails, boilerplate and other content, as you type – using a quick search or abbreviation. WiseStamp is the leading email signature tool used by over 650,000 professionals. It supports all major mail platforms (Gmail, Outlook, Mac mail, iPhone and many more) and allows you to create a professional email signature to brand yourself and promote your business in every email you send. No technical knowledge is needed and you can have your unique signature ready in under 2 minutes. The music you’re listening to is distracting you! By creating music specifically designed for your brain, Focus@Will combines Neuroscience, research, and music to increase your focus and help you get stuff done. Employees from Amazon, SpaceX, and Google rely on F@W to help them hit their deadlines and be more productive. 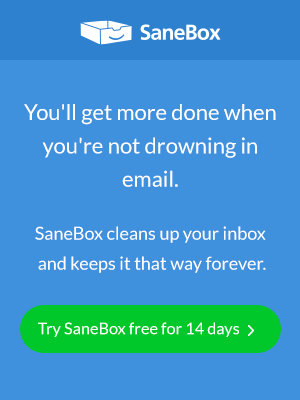 SaneBox is a premium VIP service for professionals drowning in email. It determines the importance of incoming emails, moves unimportant ones out of the inbox into a separate folder, and summarizes them in a digest. Next Entry How to Email Your Senator and Make Your Voice Heard!